Paire de globes c�leste et terrestre. 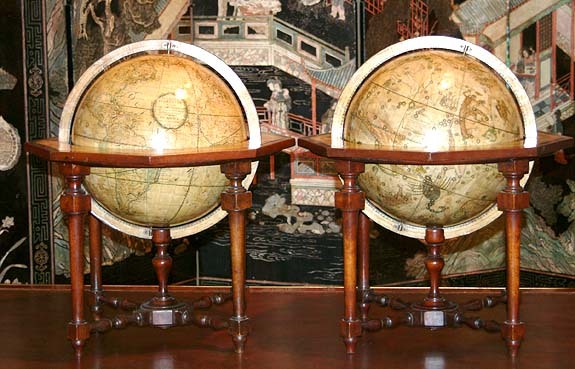 Paire de globes c�leste et terrestre. Globe Terrestre Delineato Sulle ulteme osservazioni. Con i viaggi e nuove scoperte di Cap. Cook inglese. Globo Celeste. Rome, globe terrestre dat� 1790, c�leste 1792. Italie, fin XVIIIe ou d�but XIXe. Hauteur : 59 cm. Diam�tre de chaque globe : 33 cm. Chaque globe est constitu� de 12 fuseaux grav�s et colori�s � la main, avec leurs calottes p�laires. Le cercle m�ridien est grav� sur papier et appliqu� sur bois, les tables d'horizon compos�es de graduations du zodiac et du calendrier sont appliqu�es sur un cercle hoctogonal de bois fruitier. Chaque sph�re repose sur un cercle hoctogonal en bois fruitier � pieds tourn�s et entretoises en balustres. Bon �tat malgr� quelques restaurations, impression bien contrast�e, limites en coloris ancien quelque peu estomp� et retouch�. Les calottes p�laires sont restaur�es avec quelques manques renforc�s et habilement redessin�s. Les graduations grav�es recouvrant les tables d'horizon ont �t�, en majeure partie, restaur�es et redessin�es r�cemment. La production de globes en Italie se r�sume � trois principales figures : M. Greuter, Vincenzo Coronelli et G M Cassini, n�s respectivement au milieu de trois si�cles diff�rents, les 16�me, 17�me et 18�me. GM Cassini apprend son m�tier de dessinateur aupr�s de G. Piranesi et entreprend sa carri�re de cartographe en 1787. Il r�alise les taille douces de l�atlas romain intitul� Nuovo Atlante Geographico universale r�alis�es entre 1788 et 1791. De m�me que Coronelli dans son L ivro dei Globi et contrairement � la plupart des facteurs de globe qui conservaient jalousement leurs fuseaux imprim�s pour �viter les copies, Cassini � partir de 1792 favorisa la fabrication de ses globes par la vente du Nuovo Atlante ou m�me par l�achat des fuseaux en feuilles s�par�es. 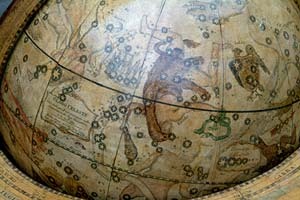 Globe similaire (globe c�leste) au : Museo della Specola, Bologna. Pair of terrestrial and celestial globes by G.M. Cassini, diameter 33cm, height with stand 59cm. Rome, terrestrial dated 1790, celestial 1792. Each globe covered by 12 printed, hand-coloured, gores, with polar calottes. 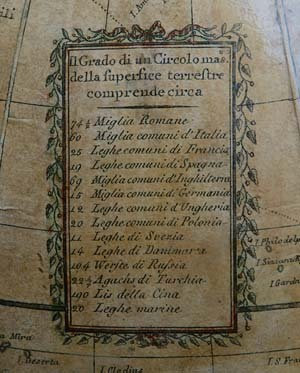 The meridian circle, paper laid on wood, the horizon ring with zodiac and calendar scales on a octagonal frame supported on fruit-wood stand, the four legs united by cross-strechers carrying the centrepost. The globes are in good condition, some imperfections are restored, but generally the globes are good and dark impressions with some remains of old out-line colour. The polar calottes are restored and small missing parts of paper are re-inforced and carefully re-drawn. The wooden horizon rings are covered by printed zodiac and calendar scales, unfortunatally the imprints are somewhat poor impressions and on many places the names, scales and cartouches are during the recent restoration process re-drawn. Gio. M.a Cassini C.R.S. inc.
One of the inscriptions also carries a table presenting the length of the terrestrial great circle in 14 different units. 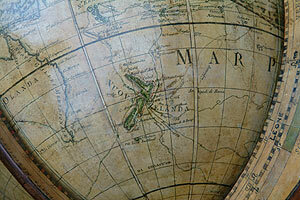 The globes shows the track of Captain Cook. Ineisso P.Gio. M.a Cassini C.R.S. The gores are engraved with the classical constellations in figured forms and with the more recently defined star groups of the southern hemisphere. 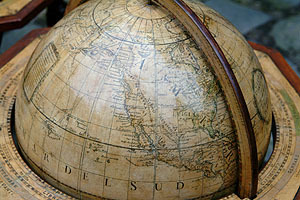 The globe is designed on a traditional external perspective and uses the nomenclature of the French edition of Flamsteed�s star atlas published in 1776. Cassini has copied various other mapmaker�s works and introduces errors, showing "Il Dorado" constellation as a swordfish, instead of a goldfish, for instance. Dahl and Gauvin comment of Cassini "His globes are idiosyncratic, containing elements that reflect academic learning and scientific rigour, yet at the same time are concerned with what was politically and religiously appropriate, and consequently introduced elements that were foreign to science per se." Ref. : Dahl & Gauvin, Sphaerae Mundi Early Globes At The Stewart Museum, p.131-134. 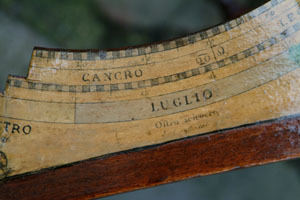 Cassini was a cartographer and publisher in Rome in the late 18th and early 19th century. He was one of Giovanni Battista Piranesi�s best disciples and one of Italy�s last globe-makers in the XVIIIth century. 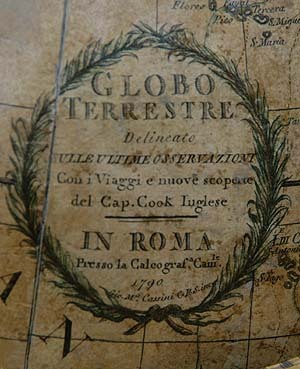 His globes enjoyed widespread success as too did his Nuovo Atlante geografico delineato sulle ultime osservazioni, published in Rome from 1702 until 1801. This important atlas Nuovo Atlante includes gores for a pair of 33cm globes. Cassini globes are found either mounted up from the gores or presumably mounted from Cassini himself.